Dovonex (calcipotriene) is a synthetic topical form of vitamin D. It is involved in the growth and development of skin cells. Dovonex is used to treat plaque psoriasis (psoriasis with scaly patches). Analogs of vitamin D3 metabolites (not the nutritional vitamin itself) can be used to treat psoriasis. Probably the best-known analog is a drug called calcipotriol, which is sold under the brand name Dovonex®. The drugs work primarily by slowing the rate at which psoriatic skin cells mutliply, and by making newly-formed skin cells differentiate into their proper forms. How, precisely, they accomplish this is not yet fully known. These drugs are usually well-tolerated, but the most-common side effect is skin irritation at the sites of application (these are topical drugs, available as ointments, creams, or scalp solution in the case of Dovonex®). Some studies have found that up to 20% of patients experience these typically mild side effects. The risk and severity of side effects can be dramatically increased by occluding (or covering) the drug, and so Dovonex® isn’t generally recommended for “skin fold” areas, where skin can occlude other skin (such as the groin or armpits). 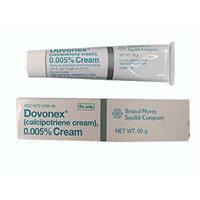 Dovonex® is also not generally recommended for use on the face, where the skin is particularly sensitive.